Draft: 2000, Kansas City Royals, 4th rd. November 7, 2015 LF David DeJesus elected free agency. 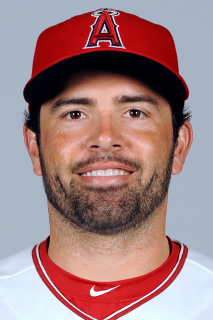 July 28, 2015 Tampa Bay Rays traded LF David DeJesus to Los Angeles Angels for RHP Eduar Lopez. September 1, 2014 Tampa Bay Rays activated LF David DeJesus from the 15-day disabled list. August 31, 2014 Tampa Bay Rays sent LF David DeJesus on a rehab assignment to Charlotte Stone Crabs. August 20, 2014 Tampa Bay Rays sent LF David DeJesus on a rehab assignment to Charlotte Stone Crabs. August 16, 2014 Tampa Bay Rays sent CF David DeJesus on a rehab assignment to GCL Rays. August 23, 2013 Washington Nationals traded LF David DeJesus to Tampa Bay Rays. August 19, 2013 Chicago Cubs traded CF David DeJesus to Washington Nationals. July 24, 2013 David DeJesus roster status changed by Chicago Cubs. July 20, 2013 David DeJesus roster status changed by AZL Cubs. July 20, 2013 Chicago Cubs sent CF David DeJesus on a rehab assignment to AZL Cubs. November 30, 2011 Chicago Cubs signed free agent CF David DeJesus. November 30, 2011 Chicago Cubs placed CF David DeJesus on the 15-day disabled list. Strained right shoulder. November 4, 2011 OF David DeJesus assigned to Gigantes de Carolina. November 4, 2011 David DeJesus roster status changed by Gigantes de Carolina. October 30, 2011 RF David DeJesus elected free agency. November 10, 2010 Kansas City Royals traded RF David DeJesus to Oakland Athletics for LHP Justin Marks and RHP Vin Mazzaro. November 10, 2010 RF David DeJesus roster status changed by Kansas City Royals. September 1, 2010 Kansas City Royals transferred RF David DeJesus from the 15-day disabled list to the 60-day disabled list.